Philadelphia's unrelenting trash talk against the New England Patriots is still in peak form months after the Eagles dethroned Tom Brady, Bill Belichick and thousands of entitled Boston fans in Super Bowl LII. A case could be made that we've become insufferable sore winners, but how else is a proud fanbase supposed to deal with a sore loser? Until Nick Foles confirms that he has received his congratulations and a large cup of clam chowder from Brady, it's open season. One Eagles fan is taking the message straight to the enemy's backyard. Over the weekend, the "self-proclaimed biggest Eagles fan alive" tweeted about a little bet that she had with her Patriots fan co-worker. If she got 4,100 likes and 3,300 retweets – numbers that symbolized the 41-33 final score of the Super Bowl – her co-worker would pay for the billboard of her choice to be displayed in Boston. Clearly, Lewis passed the test in flying colors. The Patriots fan must have forgotten that Philadelphia Eagles fans are the most rabid in the NFL – and were even before they had won a Super Bowl. Lewis still is deciding what the billboard will say and where it will be placed, keeping in mind that some businesses will likely refuse to display the message. Can’t do a poll because it wouldn’t let me enter it all. 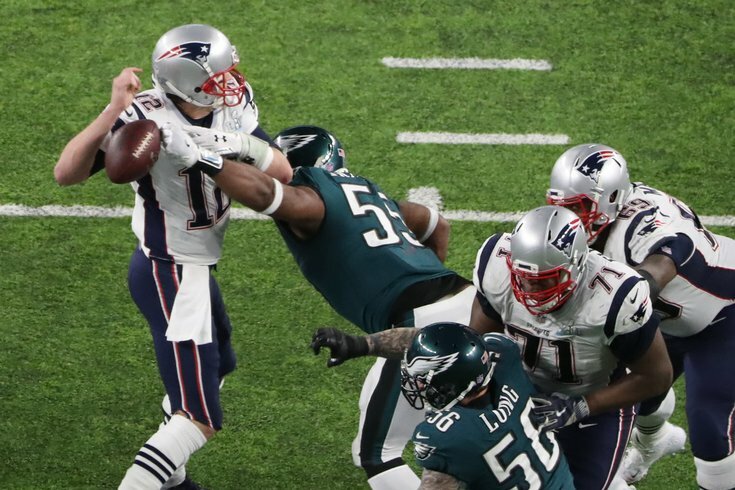 Any of those options would work, but if there's a way to superimpose it over Brandon Graham's pivotal strip sack, that should ensure Brady has reoccurring nightmares for the foreseeable future.